It’s frustrating when your older adult refuses to wear their hearing aids. But the reality is that many hearing aids don’t improve hearing enough. That’s probably why they don’t like to wear them. Hearing problems might not seem like a big deal compared to other health conditions, but untreated hearing loss is linked to serious issues like a faster decline in cognitive abilities like memory and concentration, hospitalization, fall risk, and depression. We explain how to help your older adult get a hearing aid that truly improves their hearing. What most people don’t know is that listening needs are different for each person. It’s not enough for an audiologist to check your older adult’s hearing, sell them a hearing aid, and call it a day. It’s much more complicated than that. We found an article by Senior Planet that clearly explains why helping people hear well is much harder than helping them see well. An audiologist is a health-care professional trained to diagnose and treat hearing problems. They need to look at your older adult’s specific type of hearing loss and consider all their hearing needs. If a complete evaluation doesn’t happen, your older adult might not be able to hear, even with hearing aids. 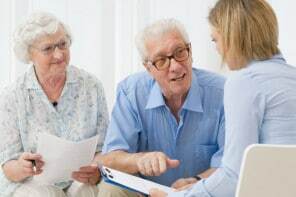 In the communication needs assessment, the audiologist finds out if your older adult has any trouble in 4 different methods of communication. That’s needed because different hearing technologies are available to help with different situations. Face-to-face communication – For most people, it’s important to be able to communicate one-on-one and in groups. Assistive listening devices, like microphone systems that can be used at home or in public areas, plus hearing aids work well for these situations. Media – Does your older adult frequently watch TV, use a tablet, go to movie theaters, etc? New technology can work with hearing aids or earphones. For example, TV audio can be sent directly to the hearing aids. Telecommunications – Your older adult will most likely need to communicate on the phone. Some hearing aids can get audio directly from a mobile phone. Captioned phone systems are also a good option. Alerts – Your older adult needs to be aware of important alerts like alarm clocks, doorbells, or smoke alarms. There are additional systems that use extra-loud sounds, flashing lights, or vibrations to help hearing impaired seniors stay safe. If hearing aids can’t solve 100% of your older adult’s hearing problem, they may need to add an assistive listening device (ALD). ALDs help seniors hear better in situations like rooms with bad acoustics, places with a lot of background noise, or when the sound source is far away. Not all audiologists do everything they should, so you might need to advocate for your older adult. The best way is to give the audiologist a clear picture of all of their needs. Make a grid of the four communication needs: face-to-face, media, telecommunications, and alerts. The information in the grid helps the audiologist determine what types of hearing technology will work best for your older adult’s lifestyle. For each need, ask how well they’re able to hear in each place. For example, you older adult might have trouble talking with someone face-to-face at a noisy restaurant or hearing other cars honking when they’re driving. However, they might be able to hear pretty clearly when having a one-on-one conversation at home. After your older adult gets their hearing aids, their audiologist should test them to make sure they work well. The hearing aids should be adjusted and checked using “real ear measurement.” That’s when a small microphone is placed next to the eardrum to test whether the hearing aid gives enough amplification for soft, medium, and loud sounds. Before making an appointment with an audiologist, speak with them on the phone to make sure they can meet your older adult’s needs. Explain that you’re looking for someone who can evaluate hearing needs and can recommend a variety of technologies at different price points. For example, an audiologist might suggest a hearing aid telecoil and a generic ALD as a budget-friendly solution instead of an expensive wireless hearing aid. You can also ask them to “unbundle” their billing. The audiologist’s service fees are listed separately from the hearing equipment. Seeing exactly what your older adult is paying for can save money.